Refuse sacks containing food waste, cardboard and dog mess has been placed in the new Tetra Pack Recycling container in Lidl’s car park. This is making emptying of these bins extremely difficult and leaving the bin full for those using the bin correctly. Out of six locations, Bingham is the only area currently experiencing this problem. If the increased costs incurred for the emptying continues, Bingham may risk losing this facility so please use it correctly. 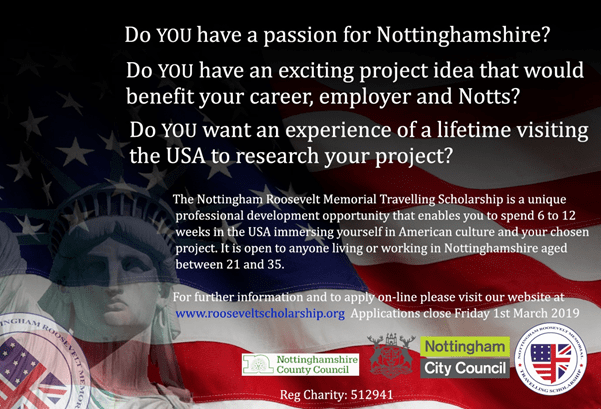 The Nottingham Roosevelt Memorial Travelling Scholarship is a unique professional development opportunity that enables you to spend 6 to 12 weeks in the USA immersing yourself in American culture and your chosen project. It is open to anyone living or working in Nottinghamshire aged between 21 and 35. For further information and to apply on-line, please visit their website at www.rooseveltscholarship.org. Applications close Friday 1st March 2019.